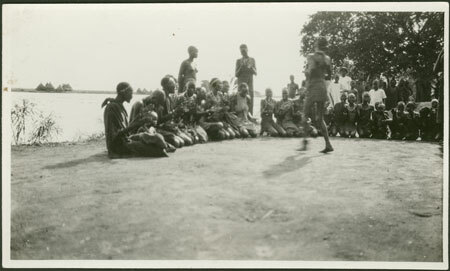 A group of women and girls near the river bank sit in a semi-circle clapping as a girl dances in front of them. Others, including men, look on from beyond. Huts of a settlement are visible on the far bank of the river. Morton, Chris. "Nuer group performing" Southern Sudan Project (in development). 03 Jan. 2006. Pitt Rivers Museum. <http://southernsudan.prm.ox.ac.uk/details/1998.204.5.55.2/>.